Our brain is a simulator for experience. Try to imagine the taste of liver and onion ice-cream. I can guess the face of disgust you’ve just made. Have you ever tried any? You haven’t. Yet you know it is a terrible idea. You can simulate the taste in your mind. We don’t drive the simulator*. It just buzzes in our heads. In many situations, it breaks down. So we skip ahead to the first thing that comes to mind. And we convince ourselves we were so clever. *In Soviet Russia, the simulator drives you. After a few years at BigCo, I’ve managed to earn the title of a free electron. As a free agent, untied to any particular project, I was allowed to choose what I want spend my time on. That’s a sweet job if ever you can get any. Anyway, convinced I can single handedly code BigCo into greatness, I’ve decided to build a framework for data visualization. Clients were really hot after this type of feature, yet almost none of our products had any visualization. It just wasn’t on the road-map for any of the upcoming releases. If no one has time to develop this, I thought, I should do it. For four months I coded at my desk, testing and documenting a generic framework for a feature nobody asked for. In order to increase chances of adoption, I focused on ease of integration. If it’ll be easy enough to use, wouldn’t they just add it to the next release as a bonus? And it really was easy. You could literally integrate with it and get it working in ten minutes or so. So, I started showing it to people. A lot of them were very excited. One project manager listed visualization as a feature, until the project missed a milestone and the feature was cut out. With a couple product managers I’ve built demos for use cases, but couldn’t get them to document their excitement as features. This happened a few times and, finally, I abandoned the framework. A few months ago, I got a phone call from someone in BigCo. Two years after I wrote it, my little framework finally made it to production. The moral of the story is that we can’t predict the future. We waste a lot of mental capacity worrying about the future, but usually we’re really bad at predicting it. Synthetic Happiness, when we don’t. Our society tries to convince us Natural Happiness is more real, but in fact research shows Synthetic Happiness is just as real and enduring. This short talk by Dan Gilbert, changed my perspective about life. It caused me to completely change how I look at decisions. You are overestimating – in many cases, the difference between outcomes of a decision are smaller than you imagine. Your mind is geared for life-and-death situations. Run-or-fight. Modern life, not so much. Limit choices – the more options you have, the more likely it is that you’ll stall the decision. Having more options doesn’t make you happy. It makes you frustrated. Since outcomes are not critical for your (psychological) well being, limit choices as often and as soon as you can. Decisions are temporary (but action speaks volume) – once you have made up your mind, don’t second guess. Act. When you wait, you learn nothing. When you act, you learn plenty. Correct your course when new information comes in. Focus on what doesn’t change – the long run is what matters. 37 signals said it best: focus on what doesn’t change. You may be unhappy with your job in half a year, but at no point will you ever be sorry for not having cancer. Focus on the constants (work out, eat healthier, earn enough but don’t fret about optimizations). Bobby McFerrin, singer of “Don’t Worry, Be Happy”, demonstrates the power of expectation. On the left, a small snippet of code that should sum numbers for 1 to a given maximum. On the right, the eye movement of the subject as he reads the code. Notice how the eye first scans the function headers, then briefly scans the function’s body and lastly focuses on where the problem is most likely to appear in real code (the loop). Work in pairs, thinking out loud to one another. Argue. If your partner says “this means X”, and you either don’t understand why or you have another opinion, demand an explanation. Read the text both “inside” and “outside”. An inside reading translates the text into English (or whatever your native language is) phrase-by-phrase; an outside reading translates a larger chunk into an idiomatic paragraph. If you only read inside, you can miss the forest for the trees; if you only read outside, you can fool yourself by making broad guesses and not verifying them with details. Class and interface dependency: look for the base classes, which depend on no other class. These, usually, are small and simple objects, with the purpose of holding a little bit of state. They may do some calculations, but are mostly built around an internal storage and a bunch of get-set functions. These are classes of Type I. Skim through them now. After you are familiar with the basic building blocks, you can look for the manager classes. Most of the time there will be a bunch of very big, hairy classes that are the core engine of the software. These are classes of Type II. Make sure you understand, from the function names, what each of these managers is supposed to do. After that, you can delve in. Manager objects usually only make sense when they interact with each other, so you have to have an idea about how all of them are designed before going into any of them too deeply. (Tip: The class called Manager is not always the manager. The class called from the main() usually is). Assume a lot: Assume that function and variable names matter. If you would have written the code, what would the GetNextIndex do? Assume it does exactly that. If a function has a name that sounds obvious enough, skip it. You’ll get back to it if you ever need to use it. Why waste your time on something you don’t need right now? There’s only this much detail you can keep in mind at this point. If you dig too deep, you’ll start forgetting things you’ve already read. Focus on purpose and structure, not on implementation. Learn by debugging: Unit tests matter, but real code matters more. If you really want to understand how the code works, the fastest way is to use it. Fire up your IDE and write a quick and dirty demo of what you wanted to use the code for. Chances are your code is bust. I’ll be surprised if you can get it to work on the first go. That’s OK. Now, start debugging. You’ll learn the inner workings of the code (and its bugs) much faster, and you’ll only focus on the parts that matter to your task. Function names matter: we’ve known this for a long time, but now we know that we scan function names first. A good name, and you don’t need to focus on the implementation all that much. Variable names matter: again, nothing new. Notice, though, how the eye goes back to the variable definition and assignments. We constantly look for reminders of the state of the variable. Loops are the source of all evil: well, that’s not entirely true, but they are worse than all other statements. Notice how figuring out the loop is the most time consuming bit of the code. It’s where most pitfalls are (Oh, the index should be smaller OR EQUAL. Right. I forgot). Commenting can help some, but just keeping the conditions simple and readable is key. Break complexity down around the loop. Short code is easier to process, so get your refactoring tools out, everybody, it’s time to split these functions. My favorite list of tips for readable code is uncle Bob’s guide to Clean Code: A Handbook of Agile Software Craftsmanship . Even if on some occasions it gets tedious and overzealous, it is still a great read for the practical coder, dealing with many issues of writing readable code and refactoring. The research certainly doesn’t prove much about the way we read code, as it was only tested on 5 (that’s right – five) people. To me it seems like more could have been done. I mean, going through the lengths of creating a really awesome eye tracking device, carefully calibrated so the machine can tell which line of code is being inspected at any moment, and then test it only on 5 people? Is getting more people into the test room so much hard work? I’d love to be a test subject and learn about my code reading habits. Next time, pick me. Computer interfaces have stayed the same for very long. Virtual, remote, locked in a glass screen and interacted with via a mouse cursor. This kept the 3D world separate from the digitized world. The dream of fully immersive virtual worlds is still years away. Computers are changing. The new mobile devices, such as the iPhone, are portable computers fully aware of their location in the physical world. They can act as a portal into a virtual layer of information on top of the real one. A virtual, digital space that we can all tap into, pull and push information from and to it. This is all fun and games, but not really useful. I don’t want to have to walk with my eyes on my device at all time. I want to act naturally in the real world, and I want the information available to me at all times. 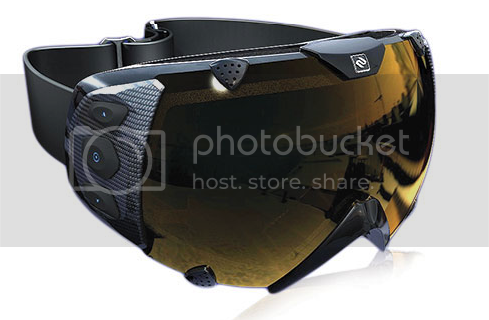 I want a pair of goggles with built-in LCD. I want a glove with a controller in it. I want it to know where I’m looking at. In his very compelling book “Daemon “, Daniel Suarez* envisioned a D-space, a digital virtual layer of information to which everybody is connected. It is the ultimate blend of reality and virtual. The technology is still far for perfect, but it is on it’s way. Minority Report style controlling gloves just turned into a reality, thanks to some very clever fellows at Oblong. These are the guys who designed the original Minority Report gloves for the movie, and in the past few years have developed the system for real. They claim it will be commercially available for every computer within five years. The only missing piece right now are the goggles. Creating a display system that is both lightweight and can accurately tell where your head is directed is still far away. Devices are available, but they seem cumbersome. They require too much power, too much equipment. They’re too expensive, too big, too obtrusive. I mean, if you were to wear these goggles all the time, you would be more in the virtual world than in the real. Wearing them you’d be stuck in the virtual world. There is no way to anyone talking to you would feel comfortable. No. It has to be much more subtle, much less intrusive. I want to be able to look the other person in the eye, and have him look back at me. What I want will look exactly like seeing glasses or even contacts. Most of the time, the display will be minimal. When going to the grocery store, I can review my shopping list. When buying a book, I can read reviews. Most of the time, I need additional display, not alternative reality. It would be nice if the display was good enough to read the news on the bus. Most of the time, however, it is the real world I want to dominate. I’d just like to have the Internet available at my fingertips to put an extra edge on reality. OK. Daydream is over. Back to work. Where did I put my phone, anyway? Can somebody give me a call so I can hear where it’s ringing? * Read it. No, seriously. Read it .